This 1989 bay gelding has a show record a mile long spanning three divisions: Arabian English Pleasure, Arabian Informal Driving and Mounted Native Costume. 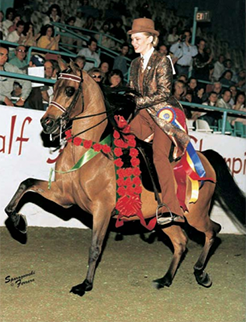 By Bask-Tez and out of the Aladdinn daughter Aladdinns Laura, he amassed two U.S. National Champion titles, two Canadian National Champion titles, two Canadian Reserve National Champion titles and ten Top Ten awards at the three national shows (U.S. Canada and Youth). He also earned multiple regional awards throughout his career.